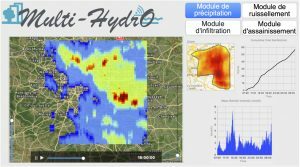 Multi-Hydro is a distributed physical model that has been developed from four open-source software applications already used separately by the scientific community. Its modular structure includes a surface module, a ground module, an infiltration module, and a precipitation module. A final module for modeling green roofs has recently been added to study the benefits of these infrastructures. These scenarios produced by Multi-Hydro are converted into 3-D images with the MH3DV visualisation software.